Working with a "chord master track"
MelodicFlow is a MIDI VST for Windows and macOS. Use MelodicFlow to create and play stunning basslines, arps, and melodies quickly. You will never sound off, as all your input is mapped to the right notes instantly. MelodicFlow contains several operation modes that automatically bend your melodies to the right notes. MelodicFlow analyzes the chords that you provide and then creates a selection of fitting notes for you. You only need to play on the white notes of the right side of your keyboard (yellow area). Concentrate on the melodic rhythm and MelodicFlow will sort out the rest for you. The yellow notes in the red circle "1" are routed from your keyboard to MelodicFlow. MelodicFlow uses these chord notes as its base input to calculate possible output notes. You cannot hear these notes, as they are only used internally (except when you turn on "Pass notes through"). The possible output notes can be seen in the red circle "2". They are shown as small white boxes on top of the keys. In this example they are built from a mix of safe scale notes and chord notes, as the operation mode is set to "Scale + chords (safe)" (bottom left box). If you play on the white notes of the yellow area, MelodicFlow will map your input to the calculated output notes now. The C in the red circle "3" will always play back the first white box, the D will trigger the second box, and so on. You can use the white notes below the "root C" as well. This is all you need to know to get started with MelodicFlow. There are also special black keys that trigger chords or transpose notes. Please take a look at the rest of this manual to learn more. Insert MelodicFlow on one track of your DAW and deposit your chords. Jam around and record your output notes on a second track. Don't have any chords yet? The "scale mode" doesn't need chord input to work, but is great for lead melodies. Simply choose from one of over 300 included scales and start playing. Electronic songwriting: Create a chord progression, then copy the chords and add as many MelodicFlow instances as you need. Draw in your melodic rhythms without having to think of the used chord notes again. Create a "chord master track" that sends the chords to several MelodicFlow channels at once. Build your own library of MIDI phrases that you can recycle for many different projects. Simply drag these phrases to your MelodicFlow tracks and the incoming chords of the master track will get handled as needed. Find out more here: Working with a "chord master track". Windows (32 bit DAW): Copy the file MelodicFlow.dll to the folder "c:/program files (x86)/Steinberg/VstPlugins/" (this is the default for most 32 bit DAWs). Windows (64 bit DAW): Copy the file MelodicFlow_x64.dll to the folder "c:/program files/Steinberg/VstPlugins/" (this is the default for most 64 bit DAWs). macOS: Copy the file MelodicFlow.vst to the folder "/Library/Audio/Plug-Ins/VST/". Copy the file MelodicFlow.component to the folder "/Library/Audio/Plug-Ins/Components/". MelodicFlow acts as a VST instrument inside your DAW. It receives notes like any other VST instrument, but won't generate audio signals. Instead it creates MIDI notes which must be passed on to another instrument to hear anything. 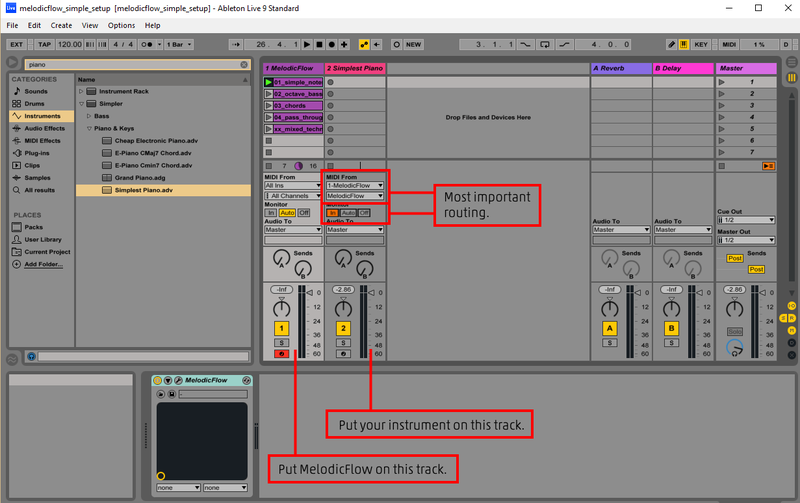 Ableton Live: How to access the MIDI output of a VST plug-in? You can find an image with a MelodicFlow example routing here: *click*. 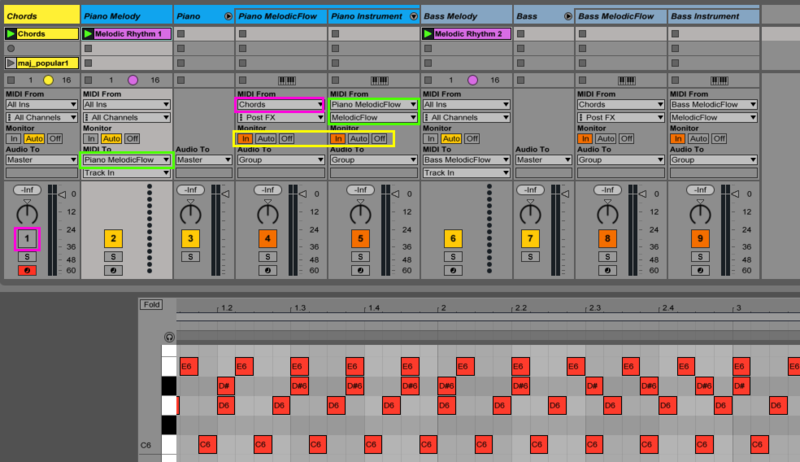 An example project is available as well: melodicflow_simple_setup_ableton.zip. Bitwig: Add MelodicFlow to an instrument track. Then add another instrument to the same track (after MelodicFlow in the device chain). Cubase: Add MelodicFlow to one track, and another instrument to a different track. From the Input Routing list on the instrument track, select MelodicFlow - MIDI Out. Turn on monitor input on the instrument track by clicking the monitor button. FL Studio: Add MelodicFlow to a new channel. Click the Wrapping Settings button. Set Output port to 1 in the settings panel. Add another instrument to a different channel. Click the Wrapping Settings button. Set Input port to 1. You can use any port number you like, but the output and input port number must be the same. Logic Pro X: Insert MelodicFlow in the MIDI Effect slot of a track. Then add an instrument in the Instrument slot. Reaper: Add MelodicFlow to a track. Then add another instrument to the same track (after MelodicFlow in the device chain). Sonar: Add MelodicFlow to a new instrument track. The "MIDI Output setting" must be checked in the "Insert Soft Synth Options" window. Then add another instrument to a second track, open the "Track Inspector" and set "MIDI Input" to "MelodicFlow -> MIDI Omni". You also have to activate the "Input Echo" button on the second instrument track. 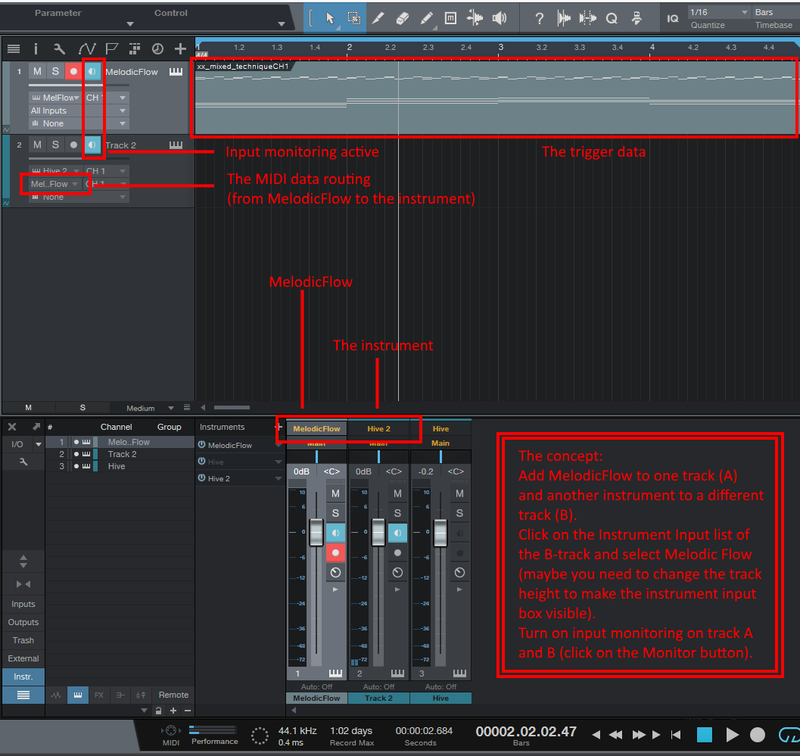 Studio One: Add MelodicFlow to one track (A) and another instrument to a different track (B). Click on the Instrument Input list of the B-track and select Melodic Flow (maybe you need to change the track height to make the instrument input box visible). Turn on input monitoring on track A and B (click on the Monitor button). You can find an image with a MelodicFlow example routing here: *click*. How to make sure that your setup works: Please take a look at the MIDI files in the installation package. There is a folder called "midi-examples". Drag the MIDI file "xx_mixed_technique.mid" on the MelodicFlow track. Play back this clip and your DAW should trigger the second instrument (which will output some sound then). MelodicFlow contains several operation modes that influence how the possible output notes are calculated. As mentioned in the introduction, the possible output notes are represented as small white boxes on the keys. Chords: Only the chord notes that are played on the left side of the keyboard are used to calculate the output notes. Useful for arpeggios, basslines, simple background melodies. Chords + scale: The output notes are calculated from all the notes of the current chord and the notes of the chosen scale. The first white box will always start on the first chord note. Useful for melodies that concentrate on the bass note of the current chord and need to be more complex than simple arpeggios. Scale: Only the notes of the chosen scale will be used, the chord notes are ignored. Scale + chords: The output notes are calculated from all the notes of the current chord and the notes of the chosen scale. The first white box will always start on the root note of the scale. Chords + scale (safe): The output notes are calculated from the notes of the current chord and the notes of the chosen scale. The chord notes and the root note of the scale are used in all cases. The rest of the scale notes are only used if they are at least two semitones away from other notes. This makes sure that only "harmonic" notes are available as possible output notes. The first white box will always start on the first chord note. Useful for harmonic melodies that concentrate on the bass note of the current chord. Scale + chords (safe): The output notes are calculated from the notes of the current chord and the notes of the chosen scale. The chord notes and the root note of the scale are used in all cases. The rest of the scale notes are only used if they are at least two semitones away from other notes. This makes sure that only "harmonic" notes are available as possible output notes. The first white box will always start on the root note of the scale. Useful for harmonic, catchy lead melodies. Scale from chord bass: The output notes are calculated from the first note of the current chord and the notes of the chosen scale. The first white box will always start on the first chord note. Useful for basslines that concentrate on the bass note of the chord, but need to walk up or down the scale from time to time. Hold down the F# in the red circle 2, then press a white note (e.g. the one in circle 1). The resulting note is played back one octave higher than usual now. The G# pitches the note up by two octaves. The G# and the A# in the red circle 3 work the same way, but they pitch the note down by an octave (A#) or two (G#). Use these "single note mod" switches to play melodies and basslines on different octaves. Use the Transpose octave section of the user interface to transpose the output notes by a certain amount. This way you can re-use the same chords for both basslines and higher instruments. Press the C# in the red circle 1 to trigger all notes of the current chord. The D# triggers the same notes, but one octave higher. The C# and the D# in the red circle 2 pitch the notes down by one octave / two octaves. Activate Trigger big chords in the user interface if you want to strengthen the first note of the current chord (bassnote). Now the bassnote will be played back one octave below the original bassnote as well. This is very nice for big pad sounds etc. Sometimes it is desireable to play back the notes as soon as you hold them down in the blue octave range. Scenario 1: Click on Pass notes through in the user interface. Now all notes will be played back as soon as you hold them down. Perfect if you want to work on your chord progression and listen to your notes directly. Scenario 2: Hold down the A# that is marked as "Pass notes through" in the user interface. Now all notes will be played back directly, too. But this time the Transpose octave mod is applied as well. This option is interesting if you want to create melodic patterns that react to chord changes instantly. Click on the small arrow button to expand the yellow playing area to the left. This is useful if you need to play melodies that go way below the main octave notes. There is an advanced way to work with MelodicFlow that will require some initial setup efforts. But the rewards are high: You will be able to create new tracks faster and better by recycling melodic rhythms and ideas again and again. Very useful for common basslines, arpeggios, chord rhythms etc. Create a new track in your DAW. Enter your chord progressions on this track. Create several other tracks that contain MelodicFlow plug-ins. Route the note output of your chord track to ALL of the MelodicFlow tracks. Enter melodic rhythms directly on your MelodicFlow tracks now. There is no need to write down the chord notes anymore, as these notes are provided by the master track. Tip: Export your melodic rhythms as MIDI files. You can import them to new tracks anytime. As the chords are provided by the chord track, you can quickly exchange and test new melodies. The setup-package contains two folders "chord-progressions" and "melodic-rhythms" within "midi-examples" that will give you a headstart. I was able to create such a setup for both Ableton Live and Bitwig Studio. I am confident that many other DAWs are flexible enough to enable this kind of note routing. However, I am not an expert for each and every DAW on the market. If you find a way to create such a routing for a different DAW, please contact me and share your knowledge. I will make sure to update this page for your fellow musicians then (I will credit you of course :). The "chord master track" (orange) contains the chords. I created a group called "Forwarders" that contains a "chord pusher" track for each "real instrument track" (like Piano, Bass,...). These "chord pusher" tracks are used to route the chord notes from the "chord master track" to the instrument tracks. For each "chord pusher" track do this: Insert a Note Receiver, set the Source to the Chords track. Then set the Notes to tracks box to "Piano" etc. For each "real instrument track" do this: Add MelodicFlow as your first plug-in, then insert an instrument directly after it. Enter your melodic rhythms in the "real instrument track". The "chord master track" (yellow) contains the chords. Put a simple piano instrument on the "chord master track" and turn off the Track Activator (purple). This is important for solo/mute behaviour. For each instrument you will need three tracks: A track which contains the notes of the melodic rhythm (in the image: "Piano Melody"), a track which contains a MelodicFlow plug-in ("Piano MelodicFlow"), and a track which contains the "real" instrument and the effects etc. ("Piano Instrument"). "Melody" track: Set the Midi To box to the "MelodicFlow" track. This will push the melodic rhythm notes to that track. "MelodicFlow" track: This track contains the MelodicFlow plug-in. Set the Midi From box to the "Chords" track. Set the Monitor field to "In". This setup will combine the notes of the chord track and of the melody track to one note stream. "Instrument" track: This track contains the instrument and the effects. 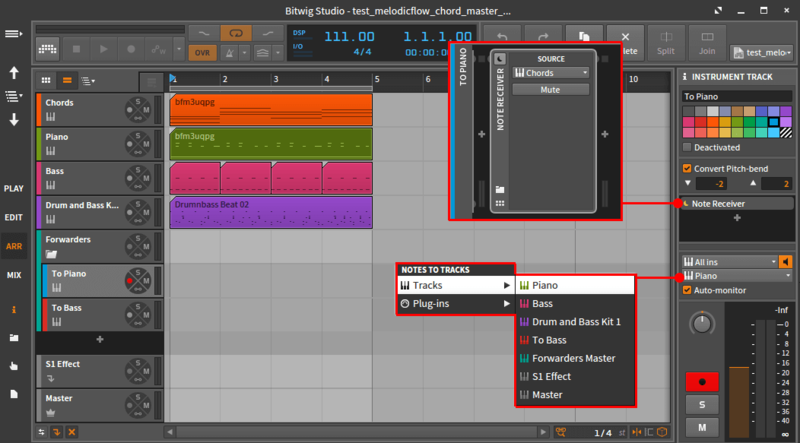 Set the Midi From box to the "MelodicFlow" track, and set the second box to "MelodicFlow". Set the Monitor field to "In". Now all the notes that are generated by MelodicFlow will come through to the instrument. Create a group that contains the "MelodicFlow" and the "Instrument" track. Use the solo button of the Piano group if you want to hear this instrument solo. As the "chord master track" contains an instrument, Ableton Live will continue to generate MIDI notes on the chord track. It won't do this if you don't add an instrument there. Solo and un-mute the chord track to play around with chord progressions. The instrument on this track will help you to listen to chords without having to use the "pass notes through" feature of MelodicFlow. You can download a simple example project here: MelodicFlow_Chord_Master_Track_Project.zip. Open it in Ableton Live and make sure to launch both the "Chords" clip (on track "Chords") and the "Melody" clip (on track "Piano Melody") at once. The following setup guide was created by a user. A big "thank you" to Peter for this! Add a layer on the channel rack. Add as many MelodicFlows as you intent to use in your template + 1 that will be set on pass notes through (this one we use to play the actual chords). Open your layer so you can see it on your screen, now select all MelodicFlows (hold shift and click on them). Once you got them all, click on set children in the layer. Drop your chords on the layer (not on any of the MelodicFlows). Setup midi ports to use. For example I use Serum to play my chords that I set to receive from port 1. Now I setup a MelodicFlow to send on port 1 and also this one needs to be on pass notes through (this one will only play the chords). Setup the rest of your MelodicFlows. These ports you can setup beforehand. I suggest renaming every instance of MelodicFlow including its port number. Now all you need to do is set your instruments to receive midi from the MelodicFlows you already have setup whenever you want to use your template. The Audio Unit (AU) version "MelodicFlow.component" is only recommended for Logic Pro X on macOS. If you work with a different DAW, you should use the VST version instead (most DAWs don't support MIDI-AUs at all). There is a simple way to come up with new chord progressions for your song. And it works nicely in combination with MelodicFlow. Sundog Song Studio is a standalone software for Windows and macOS that helps you to create harmonic songs from scratch. It contains a powerful chords page where you can click through popular chords for each scale. As soon as you are ready with your chord progression you can drag and drop it to your DAW as a standard MIDI file.